Psst… Alexis here. I just had to sneak in to say I am so excited for our first guest post of the Handmade Holiday series! And guys, it’s a good one! Without further ado, take it away, Corey! Well hello there! 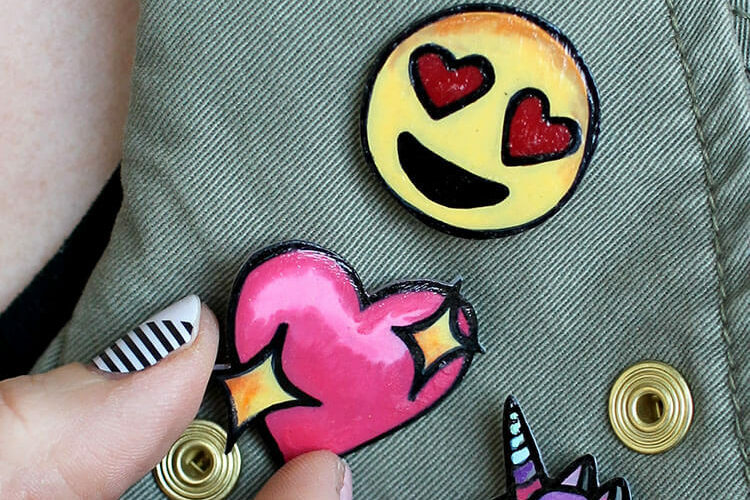 I’m Corey and I blog over at TinySidekick and I’m so excited to be a part of Persia Lou’s Handmade Holiday series! 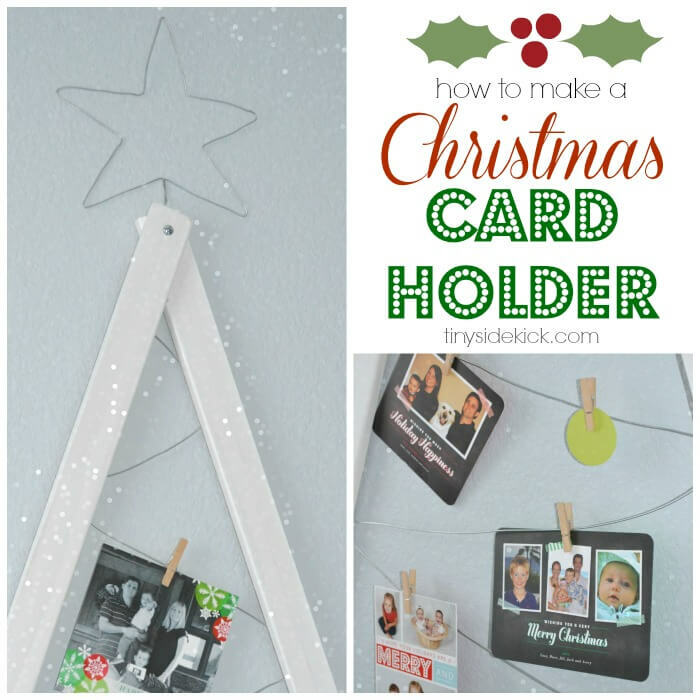 So today I’m going to show you how to make this simple Christmas Card Holder. My finished Christmas Tree Card Holder measures 3 feet wide at the bottom and 4 feet tall. You can change up the size of the boards to make it any size you want, but my supplies list reflects my finished project. Three 1 1/2 inch wide by 1/4 inch thick pieces of wood (I found mine in the trim section of Home Depot.) 1 cut to 36 inches long and 2 cut to 54 inches long. Tools: pliers, a drill, and a staple gun. First you will need to cut your wood. Did you know you can cut it right at Home Depot? It saves a ton of time and clean up. There is a saw station right there in the trim aisle. You can do it yourself or get an employee to do it for you. They are happy to help. After you cut them you will have one 54 inch piece and two 36 inch pieces. Take them home and paint them. I painted mine with some white baseboard paint that I had on hand. I watered it down just a tad bit so that the grain of the wood would barely show through. I loved the way this looked in the end. Just a hint of a natural element which is perfect. Once they are dry, lay them out in a large triangle (tree) shape having one board on top of the other. Predrill a hole for your screw and then attach with a screw that is long enough to go through the first board, and into the second board without going all the way through it. To make the star at the top of the tree, I first drew a star the size I wanted it to be on a piece of paper. Then I used it as a guide to bend my wire into the outline of that star. Be sure to leave a long piece at the bottom where the star will start and end. You will use this to attach it to the tree later. The best way to bend the wire is to hold it where you want your point to be with some pliers and bend it over the pliers. 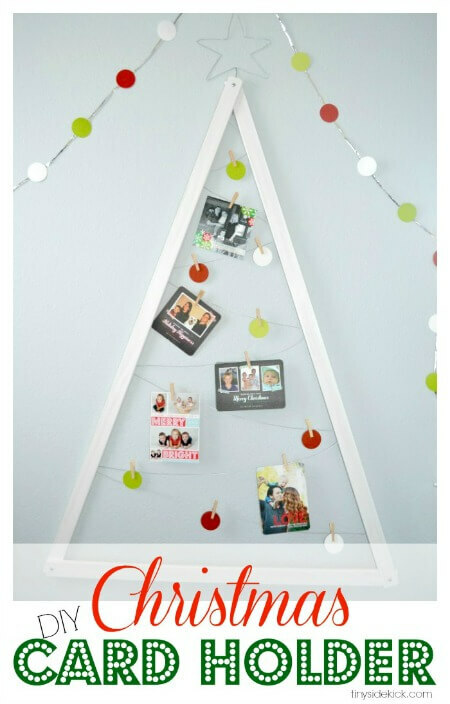 Once your tree is together, flip it over to attach the wire “garland” (this is what you will hang your cards from.) 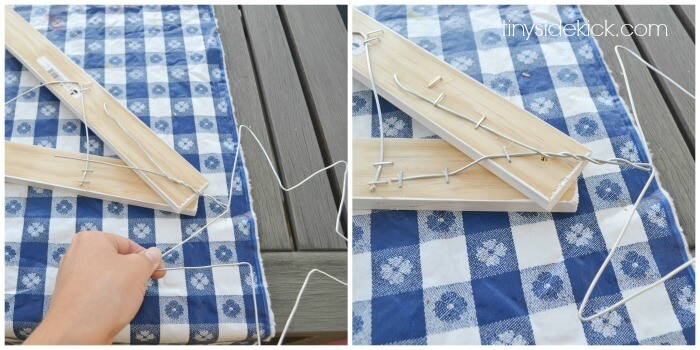 Starting at the top, lay the end of the wire flat onto the board and attach with your staple gun. Then swoop it over the the opposite side of the tree and bend it to go in the other direction. Staple it in place and then swoop it the other way. You are zig-zagging back and forth but leave a little bit of droop to give the “garland” effect. Keep in mind the size of a Christmas card when you are deciding the placement of the wire. I don’t know why, but doing this made me want to sing the song “Shoop” by Sal N’ Pepa! 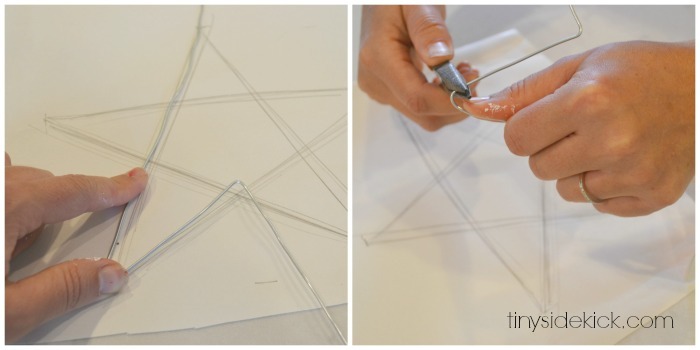 To attach the star at the top, take the long pieces that you left at the beginning and end of the star and twist them for a few inches and then pull apart in a Y shape. Place these down the sides of the tree and staple into place. I also added a few paper circles to add color while I’m waiting to fill it up with colorful Christmas Cards. And there you have it! A perfect place to display all of those cute little faces that are about to arrive in the mail! I can’t wait to start getting them, and I’m sure my mailman can’t wait for me to start getting something I actually want in the mail so that I’ll check it more than once a week! Thanks so much to Alexis for having me today! I’d love for you to click over to TinySidekick and click around! Thanks, Corey! Please go visit Corey and check out some of awesome projects! Like this chair makeover, or this super cute nursery, or these incredibly smart toy storage bags. So fun, thanks for sharing! So pretty, Corey!! LOVE the paper circles. Super cute! Thank you so much for linking up to our party… I am featuring you tomorrow! So creative! Saw your feature at Patriotic Pams and had to stop by and pin it!